Jack Nicklaus has become one of Rory McIlroy’s biggest fans. The 18 time major winner confessed that McIlroy’s win at Quail Hollow last month was one of the few times when he has been enticed to watch golf on TV this season. Having sat down with McIlroy for two hours at the Bear Club earlier this year to offer the Holywood star advice, Nicklaus has now taken a keen interest in the youngster’s career. The Golden Bear even sent McIlroy a letter of congratulations afterwards. “I said, ‘What I told you is to play within yourself, but this is ridiculous’,” said Nicklaus, who will be McIlroy’s host at this week’s Memorial Tournament in Dublin, Ohio. Watching golf on TV is a rarity for Nicklaus, who did tune in to watch 59 year old Tom Watson try and fail to win the Open at Turnberry last year. Even when Tiger Woods is contending and threatening to edge close to his record on 18 major wins, he will only watch for an hour or so. Golf is normally playing in TV at his West Pam Beach home, however, and Nicklaus said that he will often pause as he walks by the TV set to see who’s winning. McIlroy won by four shots from Phil Mickelson and Nicklaus, as he often does with younger players, wrote the youngster a letter of congratulations. Rory McIlroy on day three of the BMW PGA Championship at Wentworth. (Photo Eoin Clarke/www.golffile.ie)Jack Nicklaus has an almost paternal affection for Rory McIlroy, which explains why he threatened to kick the youngster’s backside when they met at Muirfield Village for a clinic on Tuesday. “First thing he said to me was ‘I’m gonna kick your rear end!’ haha haven’t seen him since Augusta!” McIlroy tweeted earlier this week. Watching a player you have taken under your wing lead the Masters by four only to close with an 80 must have been painful to watch for Nicklaus. Yet the Golden Bear is confident the 22-year old from Co Down will eventually learn from his mistakes, as will Nick Watney and Dustin Johnson following their major championship losses. Nicklaus on Rory: "He shouldn’t have walked off the golf course"
Jack Nicklaus with Rory McIlroy after his US Open win at Congressional in 2011Jack Nicklaus believes that Rory McIlroy was wrong to walk out of the Honda Classic and advised the world number one to forget about his problems adjusting to his Nike clubs. Nicklaus on Rory: "I surrounded myself with people that I didn't have to worry about"
Rory McIlroy is suffering on the course. “I’m trying not to let it get to me.” Picture Fran Caffrey/www.golffile.ie.This time it’s definitely more mental than dental. 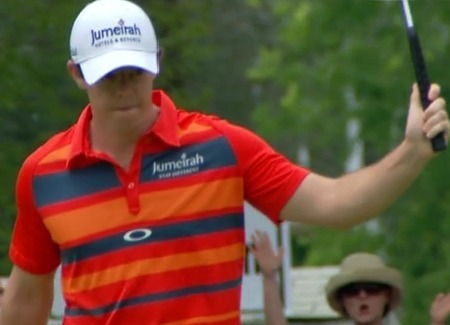 Rory McIlroy is lost on the golf course and almost certainly off it.